Start by digging a hole for planting the rose in. See if the depth is right for your area. By this I mean that in my area I need to plant the actual graft of the rose bush at least 2 inches below what will be my finished grade line to help with winter protection. In your area, you may not need to do that. In areas that get cold winters, plant the rose bush deeper to protect it against the cold. In warmer areas, plant the graft at the soil level. The grafted area usually is easily seen and looks like a knot or bump out just above the root system start and up onto the rose bush trunk. Some rose bushes are own root and will not have a graft at all, as they are grown on their very own roots. The grafted roses are rose bushes where a hardier rootstock is grafted onto a rose bush that might not be so hardy if left on its own root system. Okay, now that we have placed the rose bush in the planting hole, we can see if the hole is deep enough, too deep or too shallow. We can also see if the hole is big enough in diameter so as not to have to bunch the roots all up just to get it in the hole. If too deep, add some of the soil from the wheelbarrow and pack lightly into the bottom of the planting hole. Once we have things just right, we will form a little mound in the center of the planting hole using some of the soil from the wheelbarrow. 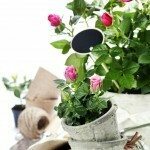 I put 1/3 cup of super phosphate or bone meal in with the soil in the bottom of the planting holes for the big rose bushes and ¼ cup in the holes for the miniature rose bushes. This gives their root systems some great nourishment to help them get well established. As we place the rose bush into its planting hole, we drape the roots carefully over the mound. Slowly add soils from the wheelbarrow to the planting hole while supporting the rose bush with one hand. Tamp the soil lightly, as the planting hole is filled to support the rose bush. At about the half full mark of the planting hole, I like to add 1/3 cup of Epsom Salts sprinkled all around the rose bush, working it lightly into the soil. Now we can fill the planting hole the rest of the way up, tamping it lightly as we go ending up by mounding the soil up onto the bush about 4 inches. I take some of the amended soil and make a ring around each rose bush to act a bit like a bowl to help catch the rainwater or water from other watering sources for the new rose bush. Inspect the canes of the new rose bush and prune back any damage thereto. 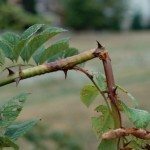 Pruning off an inch or two of the canes will help send a message to the rose bush that it is time for it to think about getting to growing. Keep an eye on the soil moisture for the next several weeks — not keeping them too wet but moist. I use a moisture meter for this so as not to over water them. I sink the probe of the moisture meter down as far as it will go in three areas around the rose bush to make sure I get an accurate reading. These readings tell me if more watering is in order or not.